Today’s post is a short one about a free project planning and task management product that our test team has begun using. Links to other free alternatives are provided here as well. A while back some of you might remember me posting about how the online testing community had helped solve our task management problem. The problem being that we had no suitable means of keeping track of our task backlog. A few kind people at the Software Testing Club had provided a few suggestions for our team to try out. Rob Lambert’s suggestion of Pivotal Tracker being the one we decided to use in the end. Last month I got an email through from Pivotal to inform me that they would be changing their product from a free offering, to a low cost option. I can’t say I was surprised, and due to Pivotal’s popularity it must have been costing them quite a bit to run. So of course it left our team with a dilemma of either paying for this service or looking for some other free alternatives. All excellent suggestions and I had a quick look at each of them. Teamlab stood out above all others and to be honest I really couldn’t believe that it was free! Not only does it look good and have a vast array of features, it’s also very polished. What I liked as well was that they are very open to suggestions for improvement from their users, a few suggestions having already been included or planned in for later releases. The application is web based and comes in two main sections. The first is the TM Community portal which presents a dashboard view of events, polls, members, wiki, blogs and forums. Which although very nice and polished provides functionality that most will already have setup via another application or not need e.g. wiki, blog, forums. However if you were looking to consolidate all these into one application, then this could be an excellent solution for you. It’s also very customisable, you can add and remove widgets from the dashboard with ease. 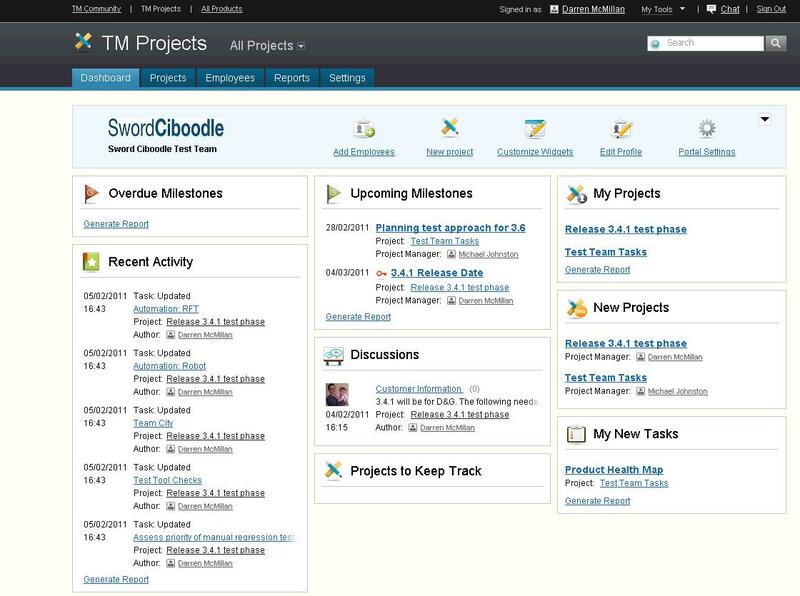 The other main section is TM Projects, which allows you to create multiple different projects. Each project can have it’s own tasks and milestones. 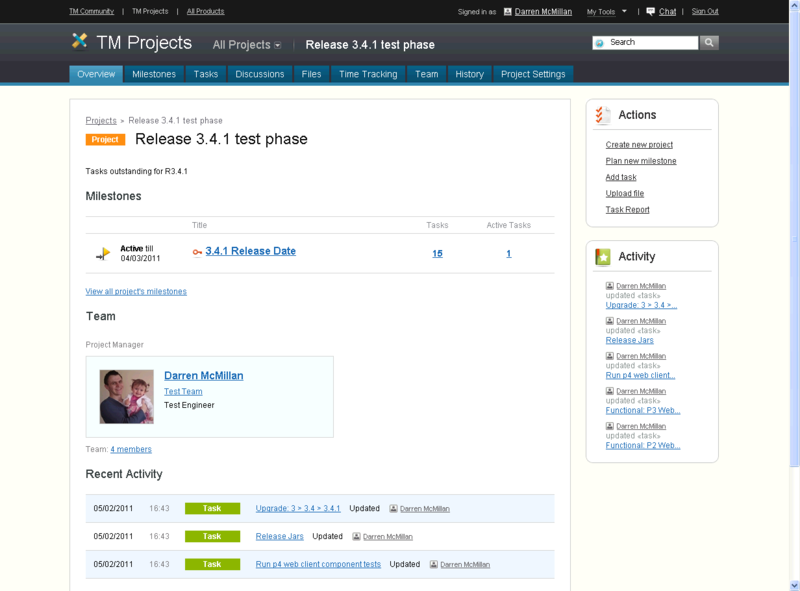 Our current usage of the projects section is to manage our task backlog and to plan upcoming maintenance releases. Again TM Projects has a handy little dashboard view which uses widgets which can be added or removed just like in the TM Community portal. I quite like the discussions feature of TM projects as it allows for an area to update members on a project with relevant information such as changes to scope, plans, stakeholder details and so on. Being able to add multiple milestones to a project is excellent. It allows you to bind tasks to a milestone and priorities them. Even simple little things like members having an avatar just make the look and feel of the product very clean and polished. The fact is I’ve been so impressed with this product I’ve offered to assist them as a software tester free of charge. Hopefully I’ll get to play a key part in it’s success in the future. If you’re looking for software to help you with project planning or task management give it a try and let me know your thoughts. Thanks once again to Del, Martin, Rob and Stephen for their help in providing our team with a free solution to our task management and planning problem. Hopefully from sharing this information I’ll have helped some others in the same situation. I’m going to look at Team Lab, it looks pretty awesome and thanks for the excellent write up. I hope you like Team Labs, do let me know what you decide to do post Pivotal. We’re happy you enjoy using TeamLab. It’s even more flattering to be estimated by true specialists. Some important facts for you to know- in a few days we’re going to introduce a new Documents section- so you’ll be able to create, edit, store and co-author docs right on TeamLab. It’ll be provided free as well. So, keep track of our news. As for your contribution- thanks a lot! We’ve sent you a direct mail in reply. Looking forward to that, and thanks for the great product. You’ll be happy to know I’m not on any sort of commission for recommending TeamLab or anything else.